Setting out into the surf. It didn't look very challenging. Surf landings are exciting and unpredictable. Yesterday, we practiced launching and landing with our friend Robert Schrack in a tricky shore break near Cape Henlopen State Park in Delaware. It wasn't a particularly rough day; in fact, once we punched through the dumping surf, the swell couldn't have been more than a few feet. Well outside the shore break, the swell was gentle. This is an unfamiliar phenomenon for Great Lakes paddlers like us. 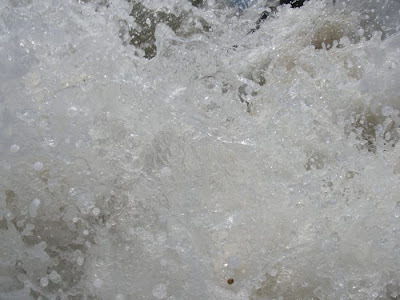 When we have waves, they're wind-driven and come in rapid succession. What you find at the shore is present further out. The breaking waves give way to swell as the water gets deeper, but we simply don't get massive shore break when there's nothing exciting going on a few yards out, and we aren't accustomed to waves that arrive six to ten seconds apart. Back to yesterday. Launching was the familiar splashy affair, the only difference being salt water instead of fresh water in our faces. But landing was a challenge. The waves were in sets but hardly predictable. The first couple of times went pretty well. 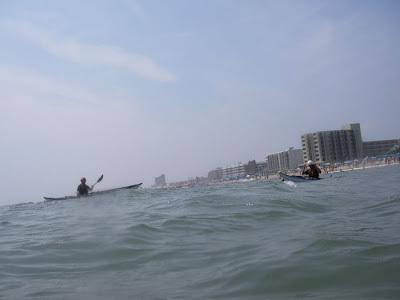 We paddled in behind wave crests, back paddled to let them pass us, then chased them again. The last few yards are always dicey, but we mostly landed without broaching, popped our skirts and ran for it. Then came the final landing before lunch. I (Sharon) watched the sets, timed it as well as I could and headed in. 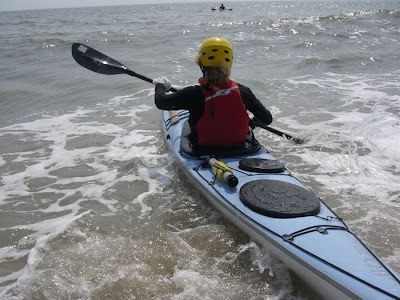 I chased a wave, back paddled while the next crest passed, chased another and so on. 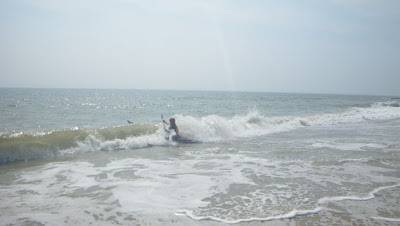 Finally, I caught what I thought was going to be the wave that would propel me all the way in. But I was wrong. As I neared the shore, another wave arrived just behind the one I had put my trust in. I felt my stern rise and rise until I was vertical and several feet in the air. A perfect pitchpole. Problem was, the water was shallow and landing on my head (or back, assuming a successful tuck), would be painful or worse. Instinctively, I twisted sideways as I fell and landed in what must have been a few inches of water. I immediately knew I was fine. As I stood onshore, a surfer who had watched my landing came over to congratulate me. "Wow, I've surfed all over and I've never seen anything like that," he exclaimed, giving me a high-five. "That was impressive! You must have been up 12 feet!" It was an amazing experience. I was surprised by the amount of time I had between my realization that I was vertical and my return to horizontality. It was enough time to consider the dangers, decide what to do and act on it. Unfortunately, I was carrying the camera, so we don't have a photo of my in-air pirouette and I'm not planning to do it again. So for now, this description will have to suffice. Yeah!!!!!!!!!!!! Glad you're ok and had a great time doing it! Life dream is to be able to replicate the pitchpole on-demand.